Zippy Junior is a fantastic children’s entertainer in Golborne. He can offer lots of different package choices including magic shows, disco’s, circus skills and balloon modelling shows. Zippy Junior has been entertaining for over 12 years and has built up a fantastic reputation. He is a full-time entertainer in Golborne and is very popular for birthday parties, christenings, weddings, nursery functions, pre-school functions and school parties in Golborne. Zippy Junior’s shows are perfect for the age group of 2-8yrs and all of the magic is age appropriate. His most popular show is the 2hr stress free show. This is designed to take the stress of the party from the parent’s and Zippy Junior takes over for you. He will start off with a fun filled magic show with a live rabbit followed by a short break for food, during which Zippy Junior will make a balloon model for every child. For the last hour, Zippy Junior will provide a disco with fun, party games, dance routines, circus skills, competitions and also provides some small prizes in this show. If you’re looking for a brilliant children’s entertainer or clown in Golborne, look no further than Zippy Junior. He guarantees to give you a party to remember. He also works in Lowton, Haydock, Leigh, St. Helens, Ashton In Makerfield and Warrington. Zippy Junior is a very professional and reliable kids entertainer in Golborne. He is well established and has residencies at hotels, leisure centres and some seasonal holiday parks. He holds Public Liability Insurance, a CRB disclosure and all of his electrical equipment is PAT tested. 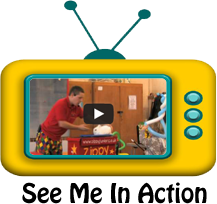 Zippy Junior uses a live rabbit in his show with is always a huge hit with the children. Zippy Junior is one of the most popular magicians in Golborne. He has won awards, been on TV and has worked with lots of celebrities. He is also the chosen entertainer for Liverpool FC, providing them with fantastic entertainment for the players’ children’s Christmas function at the Melwood training complex annually.